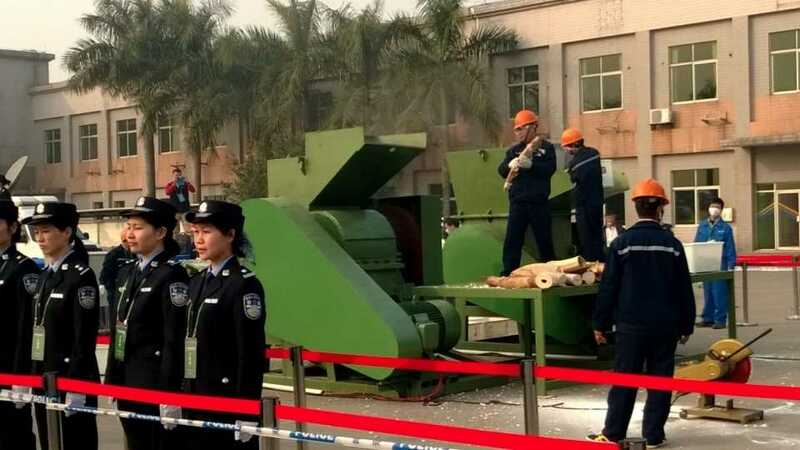 Guangdong, China — The Chinese government today destroyed 6.15 tonnes of elephant ivory seized from illegal trade in a move signalling that China is firmly behind international action to address rampant elephant poaching and illegal ivory trade. The country is the world’s biggest consumer of trafficked ivory, most of which comes from elephants killed in Africa. “The destruction of seized ivory makes an important public statement that, in conjunction with other government-led efforts to reduce demand, has the potential to have a significant impact on the illegal market for ivory,” said Tom Milliken, TRAFFIC’s ivory trade expert. 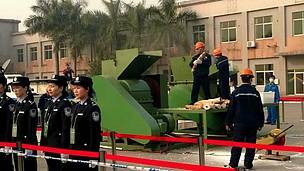 China has previously indicated it is prepared to clamp down hard against the illegal ivory trade: the ivory destruction takes place just weeks after eight Chinese citizens were convicted and sentenced to 3 to 15 years imprisonment for smuggling a total of 3.2 tonnes of ivory. Although China has a legal ivory market based on stocks that pre-date the 1989 international ivory trade ban and a sanctioned “one-off” ivory sale with four African countries in 2008, under rules of the Convention on International Trade in Endangered Species (CITES), seized ivory cannot be used for commercial purposes. 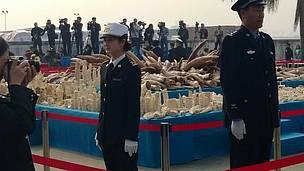 “China’s actions, more than those of any other country, have the potential to reverse the rising trends of elephant poaching and illegal ivory trafficking,” said Milliken. Government officials, together with observers including representatives from several embassies in China, CITES, United Nations Environment Programme China Office, IUCN China office, and international non-governmental organizations including WWF and TRAFFIC, attended the ivory crushing ceremony earlier today. Gabon, the Philippines and the United States have all recently destroyed ivory stockpiles, while France has also signalled its intention to do so too. WWF and TRAFFIC believe that best practice and transparency in the destruction of ivory stockpiles should transpire in the context of a robust ivory stock management system. Rigorous documentation of all ivory stocks should be maintained and a detailed stock inventory of the ivory to be destroyed should be produced. Independent audits can ensure that the quantity slated for destruction actually corresponds to the amount that is destroyed, to provide assurances that ivory does not find its way back into illegal markets, further feeding illegal trade. About 30,000 elephants are killed in Africa for their tusks each year. Most ends up in China.